In 1610 the Society of Jesus founded the Collegium Maximum in Córdoba, which was attended by students of the order. An institution of the highest intellectual caliber for the time, this was the precursor of the university. While still under the control of the Jesuits, and during the administration of the Bishop of Tucumán, Juan Fernando de Trejo y Sanabria, advanced studies began to be offered at what was now known as the Colegio Maximo de Córdoba. The school did not yet have authority to confer degrees. This milestone would be soon reached; on August 8, 1621 Pope Gregory XV granted this authority by an official document, which arrived in the city in April 1622. With this authorization, and with the approval of the church hierarchy and the provincial head of the Jesuits, Pedro de Oñate, the university began its official existence. This also marks the beginning of the history of higher education in Argentina. The Jesuits remained in control of the university until 1767, when they were expelled by order of King Carlos III. Leadership then passed to the Franciscan order. For the first 150 years after its founding, the university maintained an exclusive focus on philosophy and theology. The first secondary school in Cordoba was Our Lady of Monserrat, founded by a Jesuit priest, Father Ignacio Duarte y Quirós, in 1687 and incorporated into the university's aegis in 1907. The College of Montesrrat, as well as the original physical plant of the university and the Jesuit church, are part of the Jesuit Block, and were declared a World Heritage Site by UNESCO in 2000. At the end of the 18th century, law studies were added (with the creation of the School of Law and Social Sciences), and from this time forward studies at the university were no longer exclusively theological. Following a conflict between the Franciscans and the secular clergy over the direction of the university, the house of study was renamed (by royal decree) to Royal University of Saint Charles and Our Lady of Monserrat. With this new name the university acquired the double title of Royal and Pontifical, and Monsignor Gregorio Funes was appointed president. With these changes, the Franciscans were replaced by the secular clergy as leaders of the university. Monsignor Funes was the architect of profound reforms in studies and introduced new subjects. On May 25, 1810 the May Revolution began, and the new regime took control of the University of Córdoba, although Monsignor Funes remained in his post. In 1820 the university was relocated in other parts of the province of Córdoba, due to a situation of disorganization and chaos across the nation. Around the middle of the 19th century, a new national constitution was ratified, which outlined the new framework for the political organization of Argentina. At this time there were two provincial universities in the country: one in Córdoba and one in Buenos Aires (founded in 1821). The former was nationalized in 1856, the latter in 1881, leaving both under control of the national government. Between 1860 and 1880, many academic reforms were instituted, similar to those occurring at other universities around the world. In 1864 theological studies were finally eliminated. During the presidency of Faustino Sarmiento the sciences gained momentum through the recruitment of foreign lecturers specializing in Mathematical-Physical Science, leading to the opening of the School of Exact, Physical, and Natural Sciences. This period also saw the birth of the Academy of Exact Sciences and the Astronomical Observatory. In 1877 the School of Medicine was opened. In 1885 the Law of Avellaneda, the first law pertaining to universities, was passed, laying out the ways in which the bylaws of the national universities could be amended, and their administrative framework, leaving other matters under the control of the universities themselves. In 1886 the bylaws of the university in Córdoba were modified to conform to the new law. In June 1918 the student body at the university of Córdoba launched a movement, to which others all around the continent soon lent their voices, to fight for genuine democratization of the nation's academic activities. Hitherto controlled by interests related to the Catholic Church and the conservative lawmakers tied to the landed gentry, universities in Argentina gained unprecedented autonomy following these reforms. In May 1969 a series of socio-economic events, closely connected to the French May (which had occurred exactly one year earlier), and with participation by students of the university as well as by workers of the middle and lower classes, led to changes in the educational and political strategies of the university. During the 20th century a number of new schools were created within the university, most of which began as institutes or departments within existing schools: the School of Philosophy and the Humanities, the School of Economics, the School of Architecture and Urban Studies (with Design added later), the School of Dentistry, the School of Chemistry, the School of Agriculture, and the School of Mathematics, Astronomy and Physics. 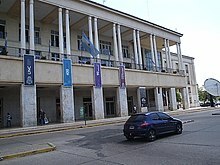 Also created were the College of Languages (which later became a School) and the Manuel Belgrano College of Business. In 2005 tensions erupted among the teaching staff, involving forceful tactics such as strikes and large-scale demonstrations in the city streets by students, faculty and citizens unaffiliated with the university, as demands were made for fairer pay and the cost of living increases required by law. As the year progressed some agreements were reached but the situation remains unresolved and protests continue. 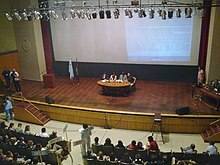 At the University Assembly which took place on December 16, 2006 Dr. Carolina Scotto was elected president for the period of 2007 through 2010, becoming the first woman chosen to direct this institution. She was inaugurated on April 25, 2007. An area located in the center of the city, made up of 23 buildings for classes and cultural activities. Hernán Ramírez, La Universidad de Córdoba. Socialización y reproducción de la elite en el período colonial y principios del independiente, Córdoba, Ferreyra Editor, 2002. ^ a b "La UNC en cifras". Prosecretaría de Comunicación Institucional e Informática de la Universidad Nacional de Córdoba. Archived from the original on 24 June 2015. Retrieved 11 June 2015. ^ "Jesuit Block and Estancias of Córdoba". UNESCO. Retrieved 20 August 2018.